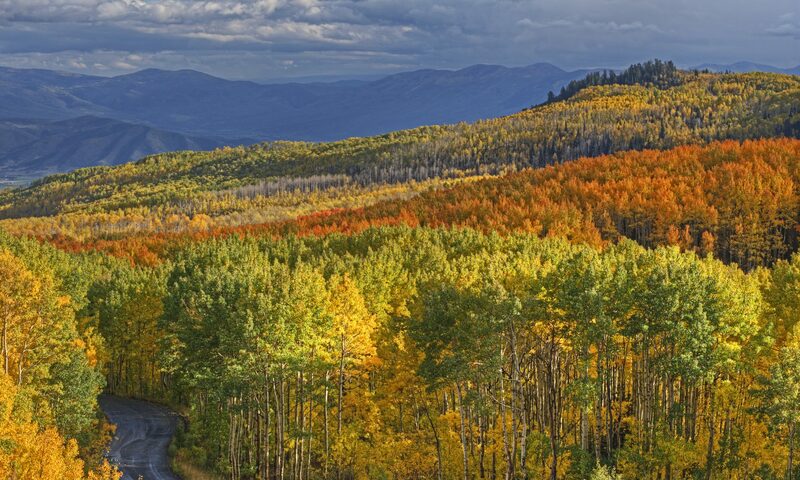 As a product of suburbia, there are many things I take for granted. Like a car. A parking space. On-site private laundry. When we bought this little charmer, I have to admit I thought we’d be just a warshing away in our own washer and dryer as I have done literally my entire life. For reasons having everything to do with having an old house full of surprises character (and ones that make for another post), we were not able to hook up our washer and dryer for four months. 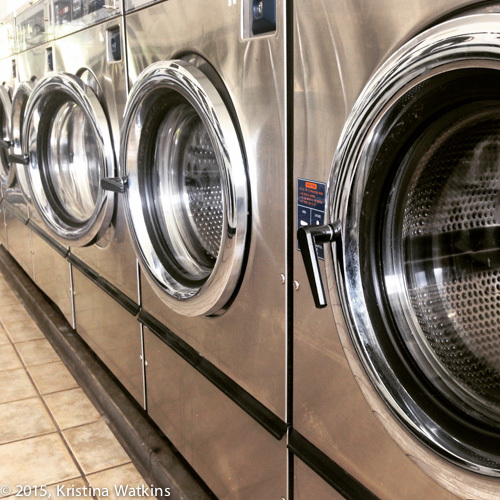 So I got to experience for the first time, in the sorry age of my 30s, just what the laundromat is all about. 1. Proximity. 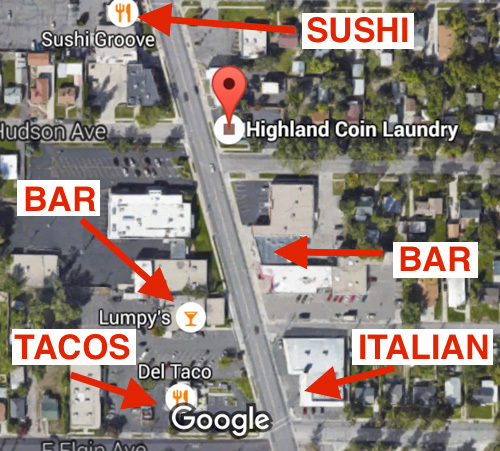 Choose a laundromat that is close-by. You want to keep the mileage on your underpants to a minimum (SORRYNOTSORRY). 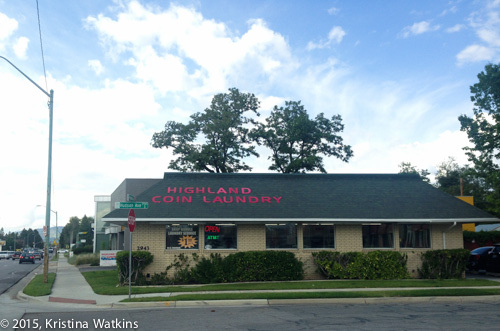 I chose Highland Coin Laundry. 2. Recreation. 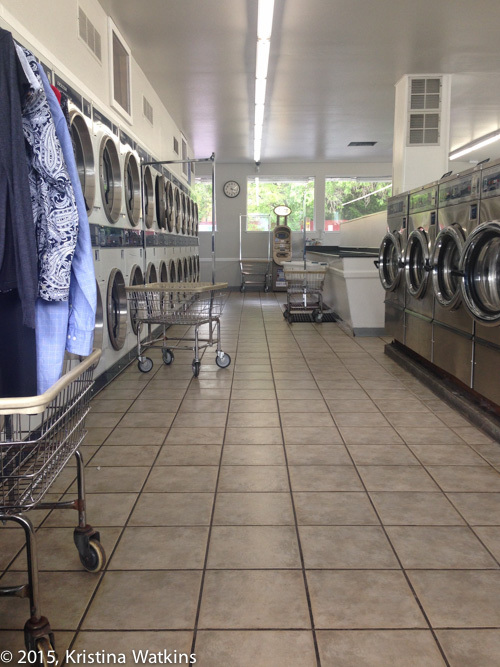 Not that you always want to leave your laundry alone while it’s drying, but it’s very common at this laundromat. Can’t imagine why. 3. Charm. 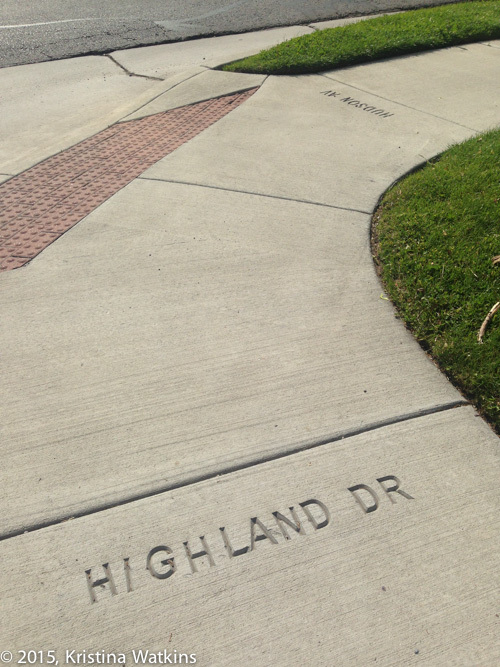 Look for unique touches; my ‘hood classes up the joint by etching the street names in the sidewalk. 4. Wipe down, level up. Bring a can of glass cleaner and some paper towels so you can wipe down a counter to fold your clothes on. The counters are where grimy fingers and Cheeto powder end up and after you’re done snacking you’ll have to fold and you don’t want that all over your clothes. 5. The nose knows. Stick your head in the washer and over the detergent bin and smell for bleach. There is nothing worse than paying $4 for a wash and having $400 worth of dress clothes come out with spots on them. 6. Bring in da vinegar, lose a da funk. *ducks* This is not your washer and who knows what’s been washed in there before. Drag in a jug of vinegar with your laundry soap and dryer sheets. Pour 1/2 cup of vinegar in the detergent bin of each load with your detergent to wash the washer while you wash.
7. I read, therefore I am. The reading materials will tell you the demographic of your local laundromat user. 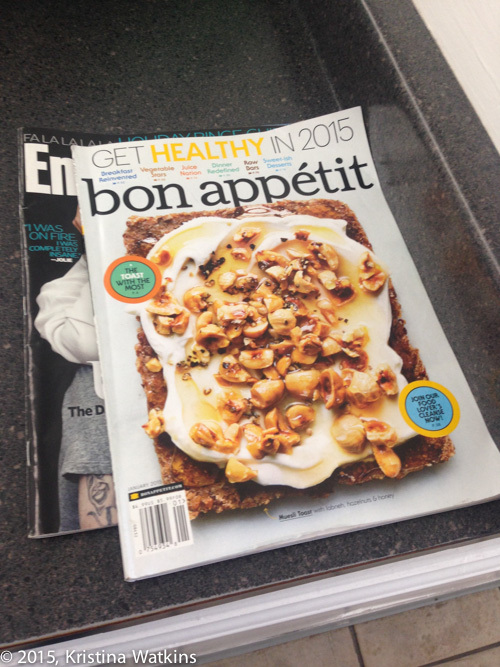 Of course somebody left a Bon Appetit magazine in a Sugarhouse laundromat. Of course they did. 8. Sense of humor, party of 1. 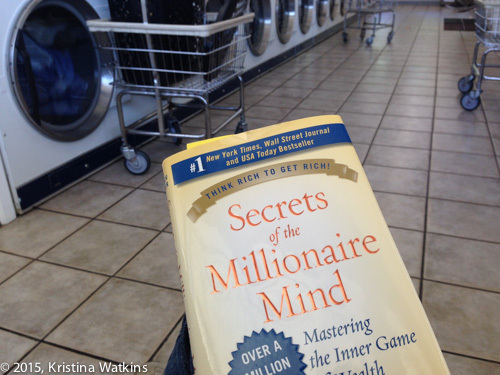 Of course, it doesn’t hurt to embrace the irony of reading your book club book about thinking your way to being a millionaire with a pocket full of quarters while waiting for the next load to finish.